Chocolate and bacon was established in America as an exotic dish, gaining popularity in the U.S. chocolate and bacon went to conquer Europe. So chocolate and bacon was a hit in London, after 48 часов с момента выхода в продажу в четырех Лондонских магазинах прилавки с необычным шоколадом опустели и пришлось заказывать дополнительные партии, and this in spite of its high price — 7,10 euro. Chocolate with bacon liked the British who for two days sold out its stock of chocolate. 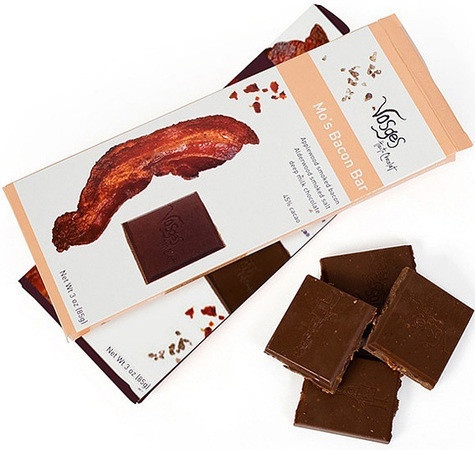 Label to chocolate with bacon says: dared to try the product «use all five senses», that «salty and sweet passion enveloped language». Директор крупнейшего лондонского магазина Selfridges Эван Вентэрс отметил — «Bacon and chocolate seem strange combination, but the result is fantastic. This is a real passion, and people like it. Some combinations of, who ever did with chocolate, for example the addition of a curry sauce, were quite unexpected, but it worked! In the world of luxury chocolate was a revolution, similar to the one, what happened, when selling a lot of years ago there was chocolate with wine. Today, people are more aware of, and quality requirements are much higher. They want exotic products instead of traditional chocolate». Chocolate with spices, such as pepper, chilli and fennel, has already created a mainstream market, but in recent years have become popular new features. There is a chocolate flavored cauliflower, basil and tomato, Chocolate flavored hay, chocolate and salt, with mushrooms, with peanut butter, sweet curry sauce and green tea, chocolate muffins decorated with chicken skin and many other exotic chocolate.